Kula Bay sprang out of nowhere in the middle of the year, but by the end of it their debut single 7 Hours was a staple on BBC Introducing in both Manchester and Liverpool as well as appearing on our list of top four tips for 2018. The Warrington four piece's new single Lost With You is out on January 20th and will be exclusively revealed via an interview and session with Michelle and Nat at BBC Introducing Manchester. We caught up with them at the Night And Day just before Christmas for a chat about how things have taken off for them in the past few months and their plans for 2018. Our review of that Night And Day headline show in Manchester concluded "Whilst it'd be unreasonable to expect a new band to be perfectly polished with less than ten gigs to their name, there's something about Kula Bay that goes beyond the immediacy of the songs and the way they play them. There feels like there's a determination already that they're going to fulfil their undoubted potential, a confidence in it that they back up by their performance and a desire to make this show better than the last one. Some of these songs might not make it through to when they get to their debut album, but in the here and now they're going to win hearts and minds once they get heard by a wider audience and that's Kula Bay's challenge for the first half of next year." First of all can you introduce yourself and what you do in the band? So how did you get together as a band? David - I was on my own, writing songs, demos at home and Oli asked me if I wanted to jam at some point. When I was in my old band, we did a Battle Of The Bands at the Parr Hall in Warrington and Matt was in one of the other bands. One night we were at a party and we saw and recognised each other and we mentioned it to each other and it went from there. At college we knew Max and we knew Matt was looking to be in another band. Matt - It was all a case of we were all doing different things and we needed to find a group. David - Exactly. I spent a year at home doing my own songs. I couldn't play on my own so I needed to find a group to work with. Oli - Days of texting each other really. We had all sort of names - clouds, waves - we wanted something summery, we wanted something that you searched for it you didn't get thousands of images of coasts or something. Max - It was quite embarrassing to give a name suggestion, because then people would have to think about it and judge it. Oli - When you google Kula Bay now or search on You Tube we come up first. It's turned out to be quite effective. 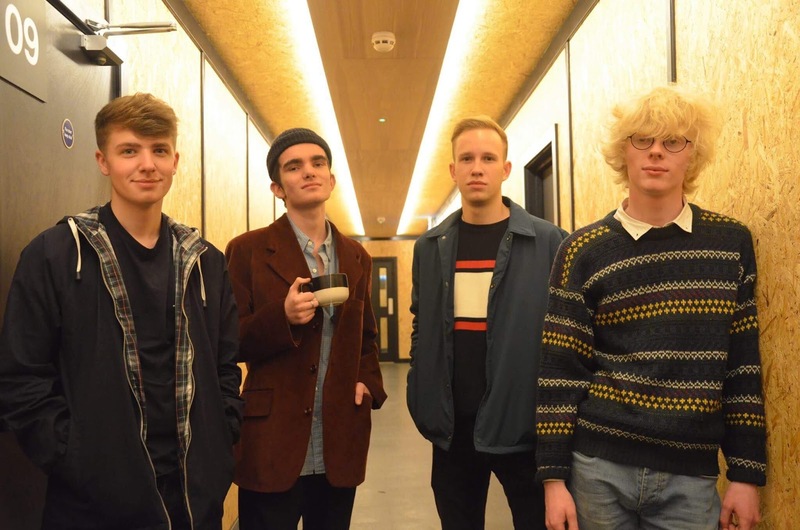 Your single, 7 Hours, has had a really positive reception with quite a lot of play on BBC Introducing. Has that taken you by surprise? David - Yeah, we didn't think any of that would happen. Matt - We didn't expect the turnaround to be so quick either. We had only uploaded it that day. Some bands take six to eight months and we got listened to within eight hours. Oli - We thought it was a good song between us, of course, but the response to have it heard and played so quickly. They put it on twitter and people were messaging us on there and Instagram saying it's a good song. We've only been a band for about half a year, for people to play our song on the radio, that's pretty amazing. It doesn't sound like a band that's been together six months though. It sounds like a band that's just about to release their debut album and this is the song that they're releasing to lead into the album. Max - I wasn't majorly surprised that people enjoyed it, because I know how good David is at writing music. Matt - It's a good catchy song. I know when I first heard it, I was listening to it as The Slow Readers Club had been on in session before it was played, I was getting ready to go out, doing something else and it grabbed me and I thought "this is good" and then ended up coming watching you that night. David - I was blown away by the fact you'd heard it as much as the fact that you then came to see us. It's weird how stuff happens though. Something small can lead to a chain reaction. Max - There's a lot of weird stuff happening now. Oli - The thing that's good is that song being played is really encouraging. That you heard it and wanted to come and see us. I feel we've got other songs that are better, but the encouragement is that if they like this then we've got more to come and hopefully they'll like that too. So what do you have coming next? David : We've got an EP coming that we had a bit of a setback with the recording process, one of those things that happen in a recording process. So we've hopefully going to have that coming out early next (this) year. That's probably not a bad thing as it won't get caught up in Christmas stuff. It'll be three tracks, one of which will be 7 Hours. What will the other two be? Are they songs that you've been playing live? David : Yeah, we've played them live, we played them both at the Academy. Oli : One's Lost With You and the other is Beach At Midnight. Matt : We usually start with Lost With You and end with Beach At Midnight when we play live. Oli : We've got so much now in terms of a catalogue. The stuff we've been writing is so good and we want to just keep firing them out. Max : The thing I find is that David's demo are really super good, even the ones before we were in a band. I think it comes from having a good ear being able to do that. David (laughing) : We've never really spoken about this stuff before or had deep and meaningful conversations about it. I noticed the other day that David has won a music scholarship at Priestley College related to Viola Beach. Coming from Warrington, does it feel like they were an inspiration? David : Yeah. My tutor at college taught them and sometimes I'll send him a song and he'll comment that it sounds a bit like Viola Beach. I don't intend it to, but it just happens that way and they did have a great sound. Max : They definitely did everything right. Why would we not want to do what they did. Someone might say we sound like Viola Beach, but Viola Beach were bloody incredible. Do you think they kick-started a scene in Warrington again? You're half way between Liverpool and Manchester and you get played on both BBC Introducing Manchester and Merseyside. Has it started something in Warrington now? David : I think so, because they did it. They were supporting Blossoms. We were at the same college so the surroundings couldn't have been that different, so if they could do it from there, why couldn't we or someone else. David : With the scholarship it really does help. I'm hoping to buy new equipment and new microphones. Rather than go in an expensive studio to do stuff, we can do fairly decent demos and then people can get an idea of what we do. Matt : It helped promote the band. Max : The thing with Warrington is that there's a lot of talented people, but what people maybe don't understand is that it takes a bit of motivation to put on nights, to get the ball rolling. We're in such a great place between Manchester and Liverpool and others like Leeds and Sheffield aren't that far away, why don't we create a bit of a scene, but it takes that effort. Oli : Because people travel either side, Warrington itself doesn't have that big a scene at the moment. Friars do put on new band nights that are really good, but there's still an access problem because of the location. It'd be nice to do it so close. Max : Friars is a venue though and they have to lean towards making money to survive rather than creating a scene. David : It needs more than one place to do it though if you want to make something. What do you want this band to achieve? How far do you want to go? David : We've been setting ourselves targets, the first was to get an EP going, so we started to record that. Then the next one was BBC Introducing and then Scruff Of The Neck. Oli : We wanted to cement ourselves with promoters who were making tracks. Matt : We're playing the Eagle Inn with DHP on 10 February as well. It's little steps. Oli : We've only been a band six months and we seem to be hitting all the goals we've been setting ourselves much quicker than we expected. First of all playing a song, getting a gig, doing an EP. We reached Introducing the day we set the goal, that was mad. Max : From that we were going to message Scruff Of The Neck, but because of Introducing they messaged us which was even more encouragement. Oli : The same with DHP. It's really flattering that people like that are talking to us without us mithering them. Max : When I started I was happy to be playing in a band. And then for the first gig we were discussing getting paid and I was shocked at that for doing something I love. But I'm glad to get paid to play David's songs. I'm happy playing bass, but all this stuff that's happening I'm really pleased about because we're getting these tracks out there that I think are really good. I'm majorly humbled by that. Matt : That's one of the coolest things for me, being able to say that I'm on Spotify. Max : We were talking about a double EP with another Warrington band, that'd be really cool. With another band it'd be half the price. And it'd be an opportunity to play with another band. People still buy things, but the physical ownership of music is dying a little. Oli : We thought about just making CDs and seeing what people will pay. It's enough for us now that people are hearing it. They'll take it home, they'll listen to it, play it in the car and then other people will hear it. It's more important to be heard. Lost With You is being revealed on Saturday 20th January on BBC Introducing Manchester between 8pm and 10pm when the band will be in session as well as being interviewed by our friends Natalie and Michelle. Kula Bay play Manchester Club Academy (January 19 with Low Orbit - tickets), Salford Eagle Inn (February 10 with Bridges - tickets) and Manchester Gullivers (March 3 headline show - tickets).